Hello Adventurers, Indo Trekkers recently published an article on hiking Mount Semeru. Mount Semeru (Gunung Semeru in Bahasa Indonesia) is an active stratovolcano and the highest peak in Java at 3,676 meters ASL (12,060 feet ASL). It is located at 8°6’28.8”S, 112°55’12.0”E in East Java, Indonesia. 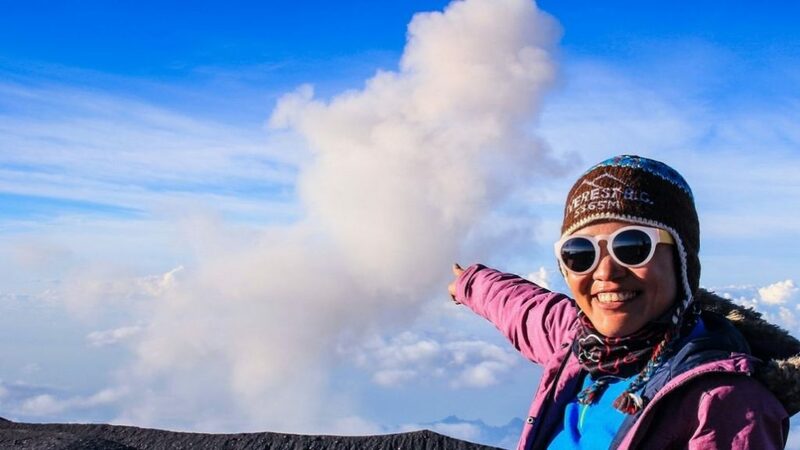 Hiking Volcano Semeru is a once in a lifetime experience with striking views and extraordinary adventure. Mount Semeru is named after Meru, the abode of gods. Semeru, means the central world-mountain. It is also known by its famous name: Mahameru, meaning The Great Mountain. There are 2 others mountains in the world with the same name. One is Mt. Meru in Tanzania, also a stratovolcano, 4,565 meters ASL, located 70 km west of Mt. Kilimanjaro. Another gorgeous beast named Meru, is a mountain in the Garhwal Himalayas mountain range on the Indian side. Elevation 6,660 meters ASL. Globally, Meru means the center of the universe, a sacred golden mountain. The Bromo Tengger Semeru National Park (Taman Nasional Bromo Tengger Semeru) oversees all hiking activities around Mt. Semeru. Recently it has implemented strict rules and regulations applicable to every hiker. This includes a daily quota of a maximum of 300 hikers and the need to be registered online in advance. The quota does fill up fairly quickly on holidays and weekends. Furthermore, every hiker whether Indonesian or foreign, must present a health certificate from a clinic/doctor during registration to prove they have the adequate level of fitness. This is a challenging hike that shouldn’t be taken lightly. Any hiking group must be accompanied by a local guide and porter for safety reasons. Unfortunately, there has been several cases of unaccompanied hikers going missing. The hike starts from Ranu Pani, Lumajang, 2,117 meters ASL. It is about a two-hour drive from Malang, either from the train station or from the airport. Ranu Pani is a small village at the foot of Semeru with about 2000 inhabitants. Starting from Ranu Pani is the only official route of hiking volcano Semeru as per the rules of the Bromo Tengger Semeru National Park. The hike from Ranu Pani to Post 1 takes about 45 minutes, there you can have a short break at a small stall selling traditional Indonesian finger foods. Then you continue for two hours through open jungle until you reach Post 4. This location offers a post card picture perfect view of Ranu Kumbolo lake (2,389 meters ASL). Enjoy your lunch break with a view of the lake. 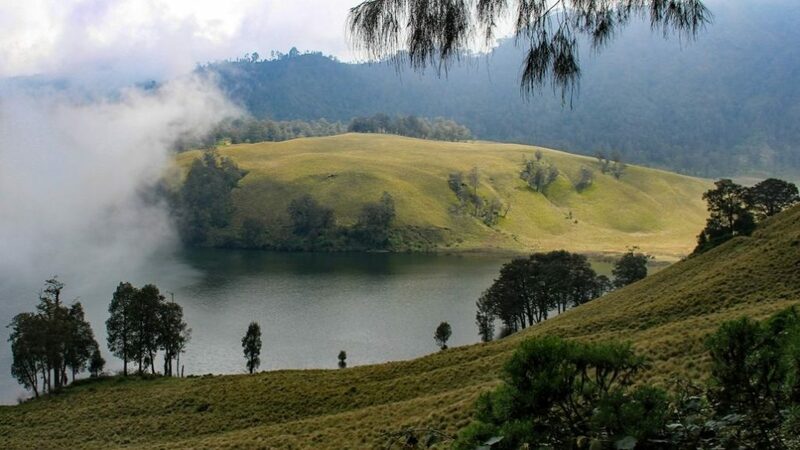 Picture perfect: Ranu Kumbolo lake at 2,389 meters ASL. When you continue the hike from Ranu Kumbolo, you must pass Tanjakan Cinta (Slope of Love) According to local myth, when you pass the slope of love, you should make a wish when you start walking. Then stay focused and never look back until you are at the top of the hill. If you successfully hike up without stopping, the myth says that your love wish will come true. The trail will lead you through lavender fields called Oro-Oro Ombo by the locals. A scent that will stay in your memory for a while. After Oro-Oro Ombo, you will pass Post – Cemoro Kandang. The nature changes to a pine tree jungle and more open air until you reach Post – Jambangan and after that Post – Kalimati. Many hikers set up their tents at the Kalimati campsite. If you started 8 am from Ranu Pani with guide and porters, you should arrive at Kalimati by about 2 pm, depending on your fitness level. There you should rest and sleep if you can to prepare your body for the next part, the trail to the summit. The summit push for Mt. Semeru needs to start by midnight. The reason for the early start is that Semeru, being an active volcano, has daily sulphurous gas cloud puffs by 10 am that are poisonous. It could be dangerous if one gets too close or the wind direction changes such that the gas cloud goes over the hiking trail. So by 9 am whether you have reached the peak or not, it is mandatory to go down to a lower level of the volcano to be at a safe distance to the gas clouds. From Kalimati you will pass fields of Edelweiss the eternal flower, tight rough jungle and a section called the Last Vegetation. After that you will battle the deep sands trek which is the last section of this active volcano. Trekking on sand takes a longer time to than on a dirt trail and is a lot more exhausting. It is similar to walking on sand dunes. With every step up you seem to slide 4 steps down. You need to figure out the right technique so you won’t slide down. It can cause exhaustion (and frustration). 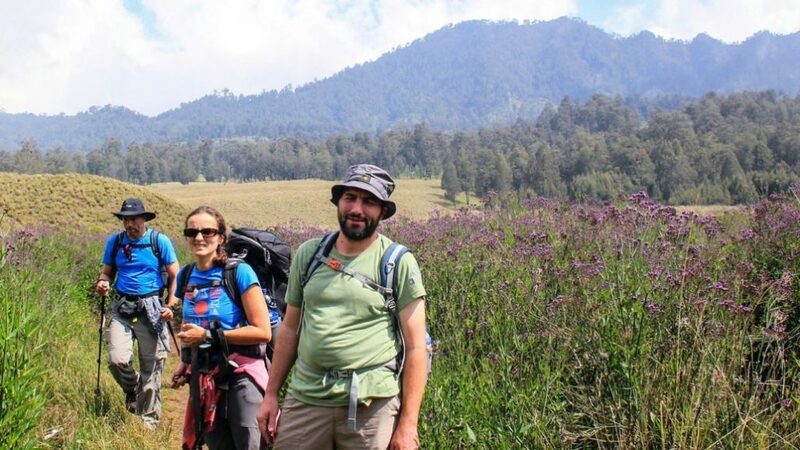 It is very important to bring a competent guide and porters when hiking volcano Semeru. They help to make sure you are on the right path, provide situational awareness and point out areas of danger. An example of such an area is just a few meters near the section of the Last Vegetation. At this time, when you are exhausted and lose focus, there is a 75m deep gorge called Blank 75 (Named as such because it’s 75 meters deep and hikers blank out). This zone is also called the Death Zone of Semeru. Some exhausted hikers have unfortunately gone missing in that zone. Hence having an experienced guide with you is critical to safely experience the unusual natural beauty of this active volcano. If you are a very fit, the total trekking duration is about three days, with complete porters and guide so you only need to carry your day pack. 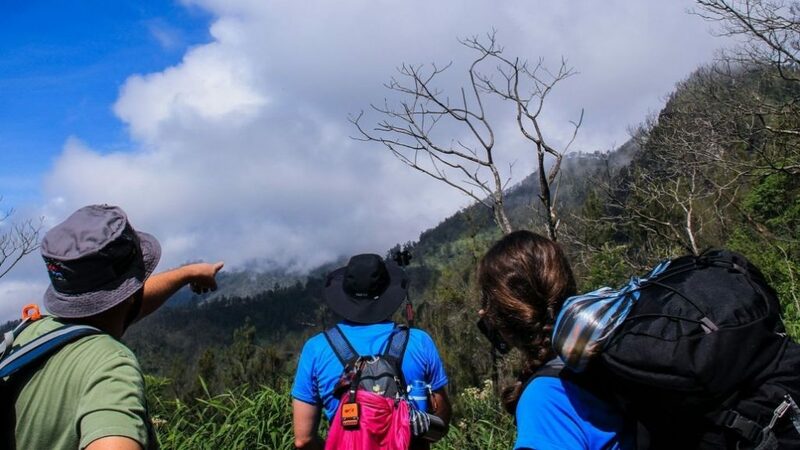 Book your trip to hike Mount Semeru, or other exciting treks around Indonesia with Indo Trekkers – complete, exclusive service to ensure your safety and satisfaction. As a bonus, here is another interesting destination visited recently by Indo Trekkers. Peyek Hill Natural Sulphur Jacuzzi and Ciu Lung Wang Buddhist Temple in Bogor. A destination off the beaten path only about 1 hour south of Jakarta.